All I ask for, at the end, is a last long resting place by the side of Innominate Tarn, on Haystacks, where the water gently laps the gravelly shore and the heather blooms and Pillar and Gable keep unfailing watch. A quiet place, a lonely place. I shall go to it, for the last time, and be carried: someone who knew me in life will take me and empty me out of a little box and leave me there alone. And if you, dear reader, should get a bit of grit in your boot as you are crossing Haystacks in the years to come, please treat it with respect. It might be me." This trip was done on the last day of the hoiiday, and the weather was a little better on this day. 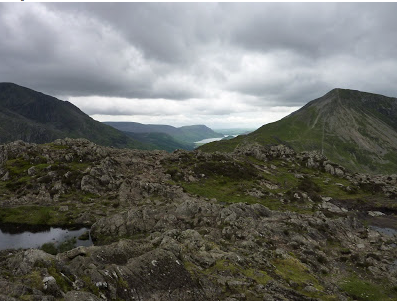 The Haystacks was A.wainwrights favourite fell and we could see why. The trip starts in a little farm car park called Gatesgarth farm (Grid ref. NY 195150) and at £3, for the whole day, was good value for money. The path then starts into the buttermere valley. 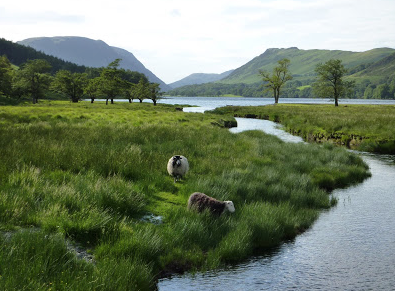 We both found the Buttermere valley to be one of the most beautiful places in the North lakes. 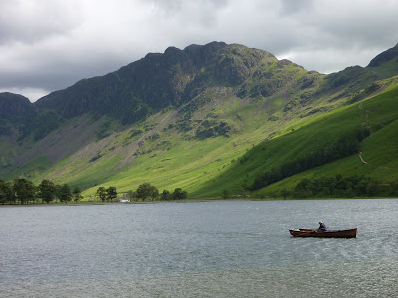 It has less visitors than the Derwent fells and should make for a more peaceful walk. 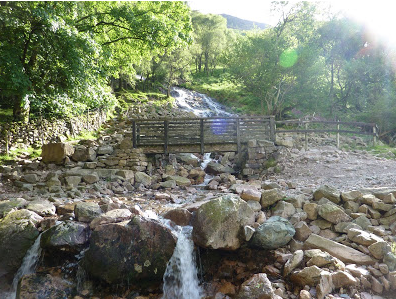 We crossed Peggys bridge and then headed up the flanks of Buttermere fell in the direction of Scarth gap pass. 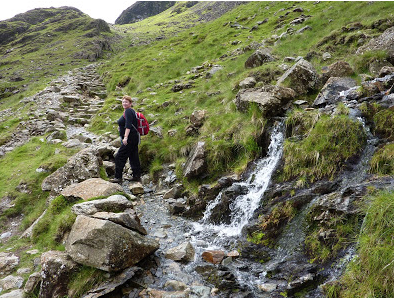 The path at the start of the walk is an easy one, however as you head towards Scarth gap pass it does weedle around a lot and I would suggest that you find your way through the scrammble, and both small & large rocks. Scarth Gap is an easy path to find at the top and when reached again cairn stones show the way. The climb to the top was both a scramble and Hard, its steep gradient made it great fun and the views are spectacular. What made it special was to find a view of Ennerdale water, where Gail’s family originated from far to the west. Infact from the top of haystacks you can see Buttermere , Crummock, and Ennerdale water. 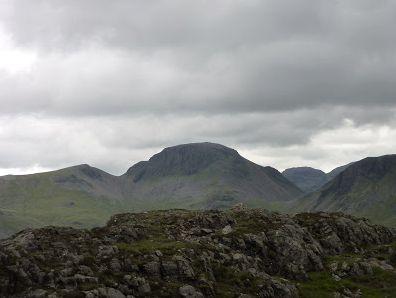 Also if the weather is good you will see the impressive Great Gable looking down on you from the South east. We then went to a special place called Innominate tarn, this is the last resting place of the fell walker Alfred wainwright . his ashes were scattered over this area by his wife and family and is a very peaceful place indeed. We took a few photos up there and the place had a few visitors, he expressed his wishes in one of his books and i have printed words to the left. After this we made our way over the top of the Honister pass and found the old tram ways and huts that were used by the quarry men. It was here that Gail’s family worked many years ago and it was nice to be on the same tracks as her fathers maternal side of the family called “Pepper” of Kirkland, Lamplugh, and Rowrah small villages around the area. From the top of honister pass we called in at the slate mine for a bite to eat and then worked our way down the pass towards Buttermere. The weather was so nice we decided to walk around the lake itself as well. The lake circuit is on a good path and before long you come to the village of Buttermere where they do great Ice cream and i found a pint of Black sheep waiting for me in a pub. After this we were off again on our travels and it was not long before we come to the large waterfall called Scale forse. This is the largest waterfall in the lakes and is impressive. This trip was one of the best we had done this year and i recommend it to anybody. Please remember that the trip up the haystacks is both steep and a good scramble, there are easier ways, but I’m glad we did this route.